Architects and builders have had basic stair building rules for hundreds of years. In recent times in many countries these rules have been brought into various building codes and made into law. Why are stair rules necessary? A couple of months ago I was going down a flight of hotel stairs in My Tho on the Mekong Delta. It was 5am in the morning. It was dark and the stairs where unlit. Even though I was fully aware that I was in a country that was home to some of the world's worst stair builder's I slipped when turning from a straight downward flight to a series of winders going around a 180 turn. I stumbled almost head first into the wall but came out of it with a bruised ego and and with blood pouring from a patch of skin ripped off my arm. When the shops were open in my destination, I went into a chemist's to get some gear to clean myself up. The old duck behind the counter gave me a small bottle of antiseptic, when I looked at the small print to see what it was she proudly stated, "made in Vietnam!". I looked her in the eye's and pointed to my bruised and battered arm and just as firmly repeated, "made in Vietnam!". If the stairs had been made to the basic rules of having all the risers even then it would never have happened. The straight flight down had risers at about 150 (6") and they changed to about 200 (10") at the worst possible place, on the bend. If it had only been a right angle bend I could have tumbled down the remaining flight in true Hollywood style and who knows how it would have ended up. If that Hotel had been located in Australia there is no doubt that at the least I could have got a few extra days free out of them on the threat of litigation. A cut and dried case of lack of performing their duty of care. If....(I'd better lighten up a bit here) my Aunt had balls she'd be my uncle! So in a nutshell the reason that we have stair building rules is to stop old fart's like me from injury or worse. Where I live in Australia we have very tough building regulations that are based on many of the old "rules of thumb" that have come down to us from the master builders of the past. These are set out in the BCA. If I refer to a specific size, treat it as a generalisation and check out your local conditions before doing any work. Stair building rules- An extremely steep stone stair at Angkor Wat Cambodia. Note the extra concrete blocks and added handrail to make negotiating the stair easier. From memory there are about fifty steps from in this flight. Imagine the result of a tumble from the top! Stairs and landings higher than say one meter above ground must have something to stop anyone from falling off an open edge. This typically takes the form of a handrail with an infill of some sort, say a balustrade, to stop someone slipping under the rail. The BCA gives the example that there should be no gaps through or under the balustrade that will allow a 150 diameter (6") ball to pass through. To assist mainly older people climbing the stair handrails have to be available at an average comfortable height, and with a comfortable grip. We use a minimum height of 865 above the nosing of the tread. Stairs in general should not be too steep. This is usually defined by a ratio of the tread to the rise or as an angle. Some stairs that are not used very often, like loft access are allowed to be steeper than normal. Also certain industrial stairs with special safety features are allowed to be constructed up to vertical. 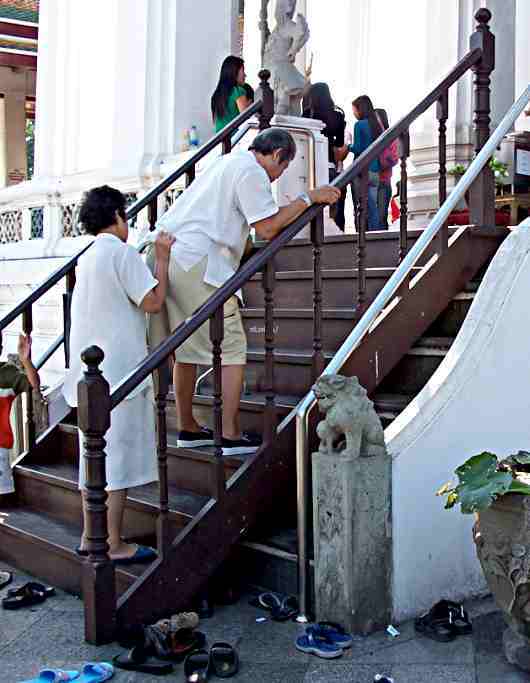 Stair building rules- Steep stairs again, this time to a temple in Bangkok. The old stairs were too steep and had no handrail. A stainless handrail has been added at some time, but then a new timber stair has been placed over the original stone one. Note! This is an example of a closed string timber stair. In any one flight of stairs: All the treads should be the same width, and all the risers should be the same height. This is basic. So often I see steps that are odd at the top or the bottom. This is very dangerous. A quick test for this is to run a string line or straightedge along the nosings to check them for all being in line. It is common for the people living in the house to get used to the uneven heights, but a visitor who is unfamiliar with the stairs could trip and fall. There is a maximum number of steps allowed in a single flight of stairs, 17, before a landing, that is a flat section, has to be used. This is to give the elderly places to rest but also to cut down the distance that it is possible to fall in an accident situation. The stair in the first photo above is obviously in some sort of public building, and as such it has a few requirements that may not be applied to a residential stair. In high traffic areas like shopping malls and other public buildings the stairs have to be generally wider to not only carry the extra traffic, but to shift the traffic quickly in case of a fire. Public stairs are normally not as steep as residential stairs. Over a certain width they may require additional handrails (in the center) to separate traffic and to act as extra safety in fire emergencies. The placement and number of stairs on any floor level has to be considered with respect to fire regulations. Quite often, depending on the materials used and the location it is common to add non-skid or anti slip features to the nosing edge of the treads, although I do not think that i is built into our stair building rules it is just good sense in many places. All stairs should be well lit. Either by natural or artificial light. Again this is not in the control of the stair maker, but the building owner should comply with this stair building rule. Stairs with solid risers should have toe space. For an explanation of this and other specific concepts see my stair design page. Head height, for us it has to be a clear space over the nosing line of 2030 (approx. door height). A stair jig Making and using a jig for routering stair strings.